Congratulations to the Amber Flag Committee who recently received the Amber Flag Award for Positive Mental Health. Their hard work has contributed to the breaking down of stigma associated with mental health and has helped to promote a culture of awareness, education and compassion for those struggling with anxiety, depression and many other issues surrounding mental health. A special thank you to last year’s Sixth Years who were also instrumental in obtaining the Amber Flag Award – Aisling Williams, Gillian O’Sullivan and Emer Lorenz. Please download the Time table. On Saturday the 29th of April, a group of forty-nine Fifth Year students and five teachers travelled to Kraków in Poland. On Sunday, we began the day by attending mass in a beautiful Bernadine church. Despite being in Polish it was interesting to see how mass is celebrated in other countries. We then went on a walking tour of Kraków, learning about the city’s rich history and visiting some of its famous buildings. After that, more walking! Our next tour was of the Wieliczka Salt Mines. We walked down three hundred and eighty-seven wooden steps until we were sixty-four metres underground. On the three kilometre tour we saw things such as corridors, chapels, statues and underground lakes, all made by the miners years ago. We even licked the walls and floor to see just how salty they were…it turns out, very! We spent Monday morning at the biggest indoor aquapark in Poland, enjoying splashing around on the water slides. In the afternoon, we visited Auschwitz concentration camp. This was by far the hardest part of the trip, yet the most fulfilling. We saw the gas chambers and crematorium, the living quarters, the shooting wall, the watch towers and the assembly square. This tour was extremely disturbing and thought-provoking. The words at the beginning of the tour, “Those who do not remember the past are condemned to repeat it”, stuck with us all. On Tuesday, we took in a guided tour of Schindler’s factory. We learned what life was like for the millions of Jews living in Poland before and during the Second World War. We saw Oscar Schindler’s original office equipment and the names of the one thousand people he saved. We rounded off the trip with a short visit to a shopping centre. Our trip to Poland was truly unforgettable. On behalf of my fellow-students I would like to thank Ms. Gallagher, Ms. MacConville, Ms. McCoy, Ms. Seery and Ms. McCauley for organising such an amazing trip for us. 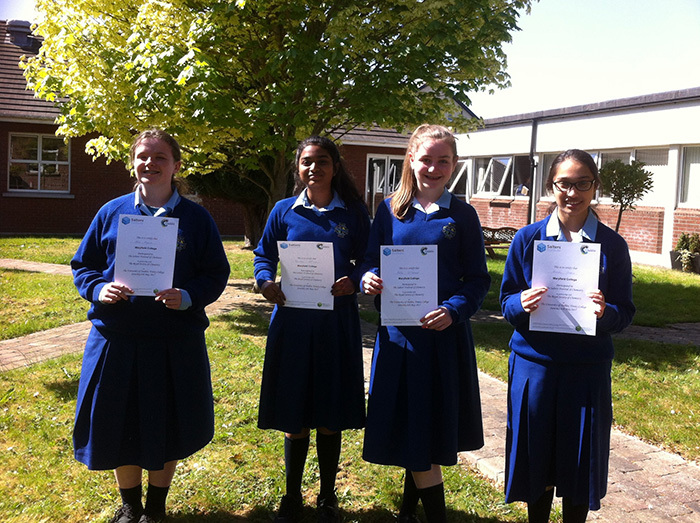 Congratulations to our First Year students who are pictured here with their Certificates from the Salter’s Festival of Chemistry. The event took place on Saturday 6 May 2017 at Trinity College Dublin. 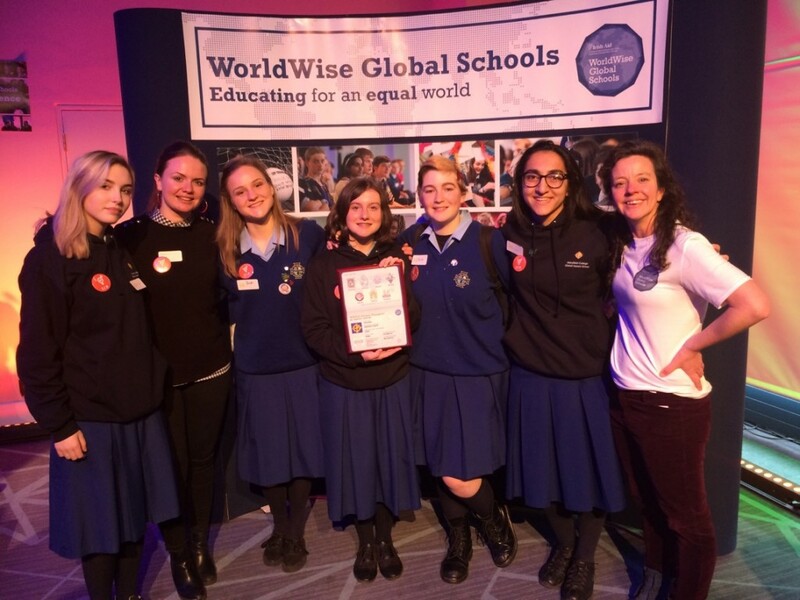 The Global Issues group were awarded a Diplomatic Passport Award by Worldwise Global Schools for their dedication to global citizenship education in Maryfield. The group have worked this year to raise awareness of global issues in the school community. They organized the Maryfield Intercultural Day in November and the celebrations for International Women’s Day in March, among many other engaging activities! Some members of the group attended the award ceremony in Croke Park on Thursday 27th April and are pictured here with Lizzy Noone from Worldwise. On the 4th of April, a “Row Against Suicide” took place at Maryfield College. Organised by the Amber Flag Committee, this day of action was in aid of suicide awareness and prevention. Maryfield students rowed tirelessly throughout the day to surpass their target of 612km (the distance from Malin Head to Mizen Head) and reached a whopping total of 644km. A massive thank you to all of the students and staff involved who made this day the huge success that it was. We are very proud of the awareness for suicide and suicide prevention created as a result of this day of action. 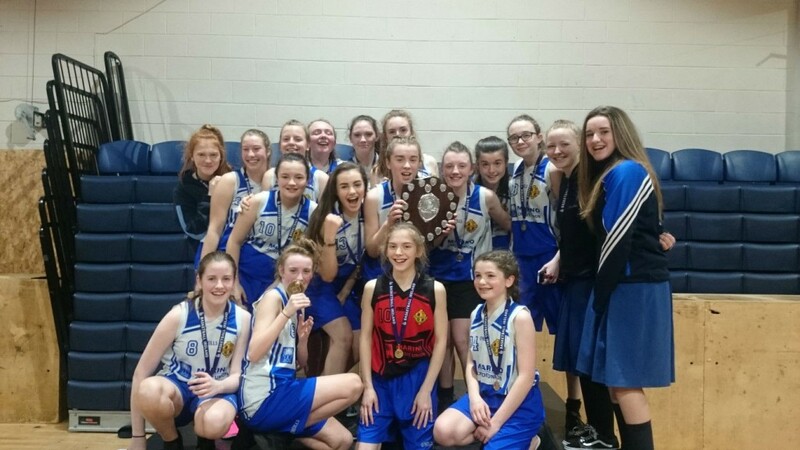 Our first year A basketball team won the division 1 Dublin and region basketball final, against Maynooth Post Primary. The scoreline was 12-14. Our second year A won the Division 2 final against St Mary’s, Glasnevin. The score was 11-2.